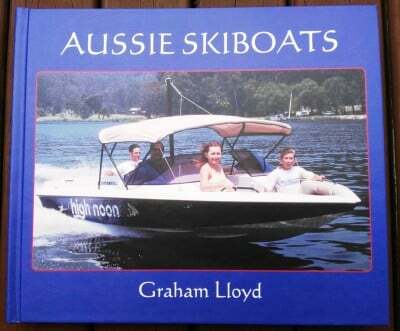 This series of large format (32 by 28 cms) hardcover books using premium lustre photo paper is intended to document and preserve at least part of the history and tradition of powerboats in Australia. Originating from my archives covering 30 years of reviewing some 600 boats for magazines such as Club Marine and Australian Powerboat, the books present details of the boats in spectacular style. Large colour photos and easily read text make for relaxed and enjoyable browsing as well as for serious study. Additional to boats from my archives, I am preparing books that feature 'your' boats. This provides a wonderful way to celebrate ownership of your boat and to record all that you see as special about it. Whether as a feature in a larger book, or as a book dedicated to your boat(s), the resulting volume will be a treasured keepsake for you, your friends and for your family including future generations. ​​Click on image of any cover for more information about that book! Scroll down for more books. IN A SELF-DESIGNED AND SELF-BUILT MOTOR CRUISER. A 1971 SERVICE TENDER FOR A SAILING CLUB IS BEAUTIFULLY RESTORED FOR FAMILY CRUISING. I felt especially privileged to be able to edit this book from information and photos provided by Phillip and Margaret Heaney and from Bruce Stannard AM. After earlier cruising the Pacific in their yacht 'Meda' (also self-designed and built), Phil and Margaret decided they would like to circumnavigate the planet in a motor cruiser that would not be subject to the vagaries of wind. Their resulting cruiser 'Argos', built on the shores of Lake Macquarie on the NSW Central Coast, carried them faithfully on a seven-and-a-half year odyssey that visited 40 countries. The book describes how they approached the design of 'Argos', the subsequent build project, and the countless adventures they encountered in their travels. Details of their current beautiful boat 'Athena' are also included. It is an amazing and inspirational story! This volume in the 'Wood On Water In Australia' series features a wonderful story of the 21-foot launch 'Salty Dog' that was built during 1971 by Herbie Jones in Sydney and restored during 2010 by shipwright Doug Fielding on the Gold Coast. Doug along with his wife Niki, and their daughter Chloe, are passionate enthusiasts for wooden boats and Doug's restored masterpiece is often used for family cruising. They operate their business Regatta Marine Boatbuilding and Shipwright Services from the Gold Coast City Marina, and Doug has now restored a number of classic wooden craft to help preserve the heritage of these beautiful Australian boats. ​Doug and Niki kindly provided all the details and photos, and it was a pleasure and privilege for me to be able to edit them into a format for the book - a most enjoyable project! Click on each cover for more information. Let's get the bad news out of the way. Regretfully the market for books such as these is not nearly sizeable enough to attract publishing companies, nor to justfy the costs of mass-printing. Therefore they are viable only through self-publishing and one-off printing. The unfortunate consequence is that the print cost is from $125 per copy, and can be up to $250 or even more, including GST and shipping within NSW. If the cost is more than you wish to pay yourself, consider sharing it with a few friends and passing the book around. If you are in a Club or association, consider buying the book as a Club reference. They make superb gifts too. I'm sorry they are a bit expensive. At this stage I don't know of an alternative way to document all these great boats. If there is a benefactor/sponsor anywhere who would like to fund a volume print run, please let me know! On the other hand, there's virtually nothing else like these books; they are more like a collectible item than 'just' a book. The images and information they contain are unique, as is the impression they create. On a coffee table or in a bookshelf, the books stand out and attract attention. You will be proud to own one - and to 'show it off'! 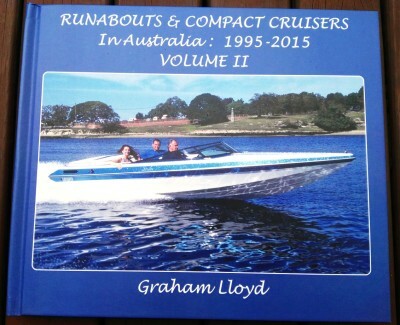 My objective with these books is simply to record the details of as many Aussie powerboats as possible. The number of boats I can personally photograph and obtain details for is limited. Your help in capturing the details of your own boat(s), or others you know, would be very welcome! Please send in suitable photos and details and I will lay out the pages to present the boat, or boats, in great style. See the 'Contribute a Boat' Page for how to help in this way - many thanks! ​​To meet individual preferences, and to cater for anyone who has not purchased a copy of the first volume of 'Wood On Water In Australia', a number of different Editions of the books have been produced. ​​'Wood On Water In Australia - Edition III' features the 14 ski/race-boats and launches from Volume II but has none of the cruisers. ​​'Wood On Water In Australia - Edition IV' features all 15 cruisers from both the first book and from Volume II (no ski/race-boats or launches). ​​'Wood On Water In Australia - Edition V' features 35 ski/race-boats and launches from both the first book and from Volume II (no cruisers).